Early childhood development can have a monumental impact on the future success of your kids. Enrolling them in preschool is the first step you can take to help prepare your kids for the challenges and beyond, and Creative Learning Arts School the perfect choice for parents in the Bethesda area looking for a fun and educational experience. Our preschool curriculum includes music and art classes, language immersion, and more. Aside from choosing the right preschool program for your child, you can also help them grow by encouraging them to learn at home! Today, in part two of our series on creative learning opportunities, we offer three more ideas you can try! One way you can help your child get a jumpstart on learning letters and words is to label everything in your home. It’s a great way to help them feel more familiar with the alphabet, and it helps them learn that every item can be associated with a specific set of letters. Try to write the labels clearly, with the same size and style of font, to make it easier to identify for the little ones in your household. When they are old enough to understand the alphabet, you can use your labels in one of the games we mentioned in part one of this series, and ask them to find an item that starts with a certain letter or sound. You can help expand your child’s vocabulary and understanding by pointing out different businesses or buildings while taking a walk or running errands. Help them identify the gas station, the grocery store, and other common points in a community. You can make cards with simple images and the name of each item on them if you want to make progress with reading and spelling. You can also help them simply gain knowledge about their community by quizzing them about the purpose of each place and who works there. 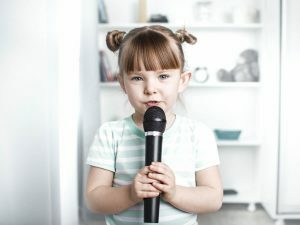 Studies have shown that music is a great memory tool, and you can harness it to help your child learn and retain vocabulary words by singing. Funny tunes and rhyming words make learning more enjoyable and more effective. We are all proof that it works — after all, who could forget “the Itsy Bitsy Spider” or the ABCs? Encourage singing during playtime, bathtime, and time spent in the car running errands, and ask your child’s preschool teacher to share some of the songs they sing in the classroom so you can utilize them at home too. Young children have a lot to learn, especially in the years leading up to kindergarten. With these strategies, you can help your kids gain skills and knowledge they’ll need in school, and set them up for success. Preschool is another important step in preparing them for the future. Creative Learning Arts School offers a variety of lessons and classes that will keep your child engaged and ease them into the routine and expectations that come with kindergarten. Give your child a head start and enroll them in our Bethesda preschool today!